The Leaving Cert. Applied classes had task assessments during the week, the 6th year group being particularly busy with 3 tasks for examination. 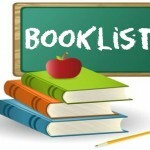 The Junior Cert. mocks begin on Thursday next running through the following week while the 6th year mocks run from Monday 14 to Friday 18th when the Mid Term starts. 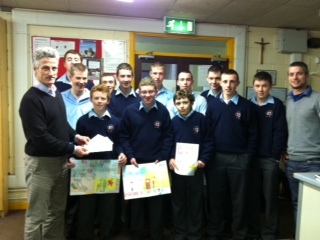 Mr. O’Brien and Mr Chappell , Art Teacher with LCA students who ran an art competition with 1st years to raise awareness around bullying. In a busy week of sporting activity., the U-16 Badminton team travelled to Dublin for the Leinster Finals and only lost out by 1 game in the final to St Finians of Swords who have a number of internationals on their side. Only the previous week the team had won the Wexford final defeating another Good Counsel team in the final. It was a great effort from the team and their coach Ms Byrne. 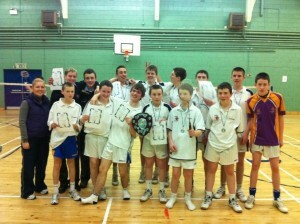 The U-16 Badminton squads with coach Ms. Byrne after their victory in the Wexford finals. In handball 1st years Patrick Carthy, singles, and Danny McWilliams /Pj Chapman, doubles, advanced to the Leinster semi finals in the 40 x 20 competition earlier in the week. John Walsh and Sean Stafford also progressed in the u-15 doubles. Well done to all of them. In football the U-14 team moved within one step of retaining their Leinster Title with a hard fought win over St. Peters in the South Leinster Final. The game played in St Patricks Park, Enniscorthy was finely balanced right to the end but the Counsel boys would not be denied. The Seniors were less fortunate suffering a heartbreaking defeat to St Marys Edenderry who scored a winning point 5 minutes into injury time after the Counsel had clawed their way back from a 4 point deficit. It was a cruel blow for a team who had shown tremendous courage in the second half after a subdued performance in the opening period. Despite exiting the championship, this group have been fine ambassadors for the school. Hopefully they will have better fortune in the hurling championship against Birr C.S. next Saturday. 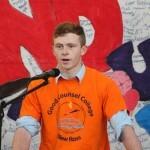 Swimmers from the Good Counsel College travelled to The National Schools Swimming Finals at the Leisure Land Centre in Salthill Last weekend 29th to 30th Jan 2011. Only two swimmers from the school qualified for the championships nationals this year, Luke FitzGibbon,3rd Year and Ben Curran,1st Year. Ben had qualified in the 100m Back Stroke and the 200m Individual Medley where he finished a very respectable 6th and 10th respectively. He finished the highest in his age group as he was swimming out of age this year. Luke FitzGibbon was competing in the nationals for the 3rd succesive year and retaianed his title in the 200m Back Stroke Invitational Time Trial. In his other event he was beaten into 3rd by one hundredth of a second. 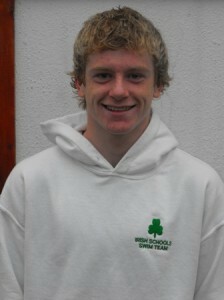 Luke also swam out of age and is currently the fastest in his own age category in Ireland. Schools Swim team which will be hosting the WISE (Wales, Ireland, Scotland and England) Swim Meet later this year and he will also be representing the school for another year at International Level. Well done to both boys and best of luck in the coming years swimming events. Both swimmers are members of the New Ross Swimming Club and train at the Kennedy Memorial Swimming Pool and the National Aquatic Centre.